Ulster Camogie Council celebrated the strength and standard of volunteerism within the Province at the NWP Recycling Ulster Camogie Awards Lunch on Saturday November 24th in Kelly’s Inn. Ulster Camogie Chairperson Kathleen Woods was joined by special guests Cumann Camogaíochta Uachtaran Aileen Lawlor, Ulster GAA Vice President and Integration Committee Chairman Martin McAviney and representatives from NWP Recycling as twelve awards were presented. After many years of dedicated service to Ulster Colleges Camogie Sr Mairead Ní Fhearáin was presented with the Chairpersons Award. Sr Mairead has been involved with Ulster Colleges Camogie for many years taking on various roles with great success. Antrim Legend Mairead Magill (nee McAntamney) was presented with the 2012 Volunteer Award. Mairead was named on the Camogie team of the Century in 2004 and is the winner of two All-Ireland Senior Championships with Antrim. Mairead has been an great volunteer and ambassador for camogie across schools, club and county levels. Ann Grimley from Armagh was presented with the Administrator of the Year Award. Ann is a member of the Madden club in Armagh has been involved with the club for over 50 years as a player and administrator. Ann served many positions on the Armagh County Board, treasurer for Ulster Camogie and a member of the National Hearings Committee. Martin Donnelly from Tyrone was named as PRO of the Year as Armagh again claimed the County Final Match Programme of the Year Award. 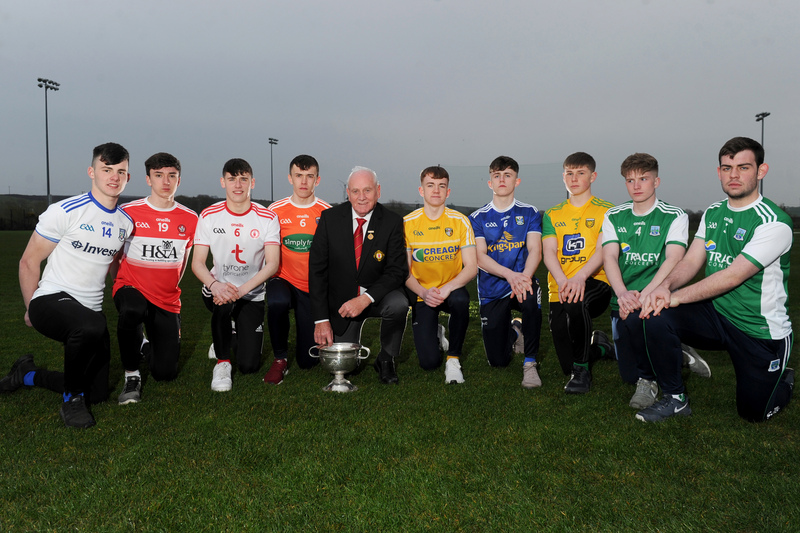 It’s been a great year for Derry as they were undefeated in 2012 and won the All-Ireland Intermediate title, National League Division II and the NWP Recycling Ulster Senior Championship. To add to the accomplishments Aileen McCusker won Ulster Senior Player of the Year and Derry manager John A Mullan scooped the Coach/Manager of the Year award. 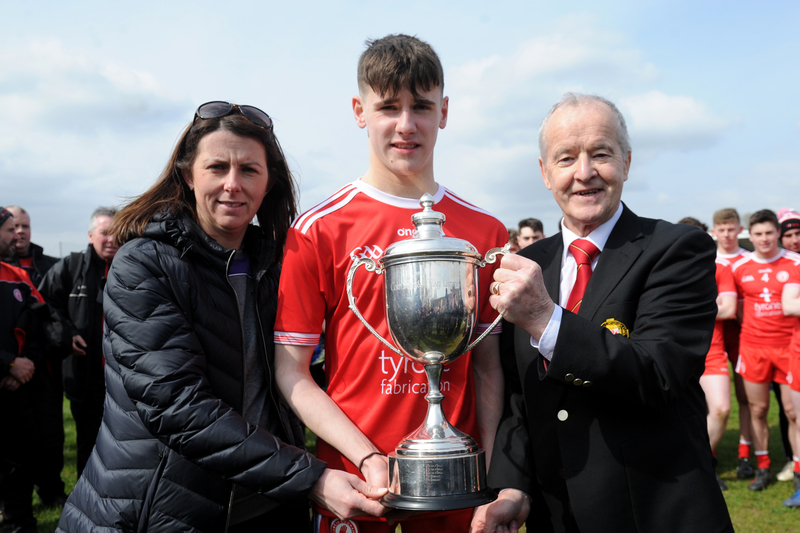 Double Soaring Star and Down forward Niamh Mallon won Minor Championship Player of the Year as Down won the Ulster Minor Championship and All-Ireland Minor C title. Aine Donnelly from Tyrone won the Minor Shield Player award. 2012 saw new awards added as Derry’s ‘Gentle Giant’ Sean McGuigan won the Inter-County Referee of the Year Award. Grainne Coulter of Ballygalget won the Emerging Referee of the Year award and had a great year as this was added to the Down Intermediate Championship medal she won in September. ‘2012 has been another great year for Camogie in Ulster. 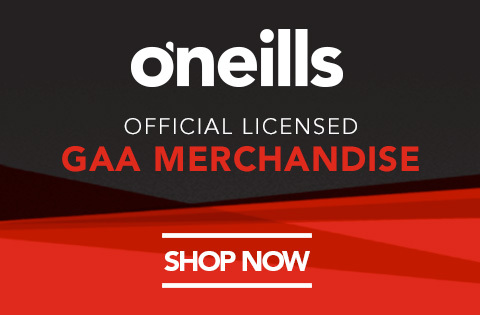 On the field the success of Derry and Down at National Level has seen Camogie in Ulster develop further and the return of an Ulster side in Derry in the All-Ireland Senior Championship is a big boost for the Province. Today we celebrate our volunteers, administrators, coaches, players and referees. We must remember to value all these people who work so hard to develop the game. 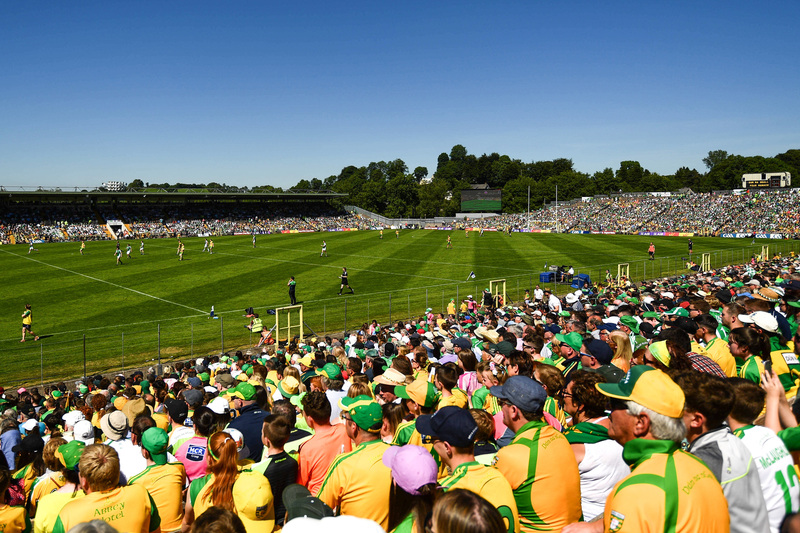 I thank all these volunteers who give so much to the game of Camogie and to improve our communities’. 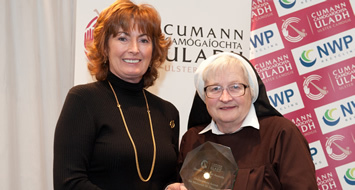 Photo Caption: Kathleen Woods pictured with Sr Mairead Ní Fhearáin.